Today, Oregon teachers, students, and working families can celebrate a big win. Oregon schools and essential services won’t suffer the loss of over $1 billion dollars over the next few years, now that Oregon has rejected one of the most egregious pieces of the Trump tax scheme. This tax break, like the Trump tax scheme overall, is heavily skewed in favor of the most-well off. It also threatened to drain over $1 billion from schools and essential services over the next few budget periods. In February, the Oregon legislature passed Senate Bill 1528, which severed ties with the pass-through business deduction. Today, Governor Brown announced Senate Bill 1528 will become law. She deserves a thank you for doing the right thing. 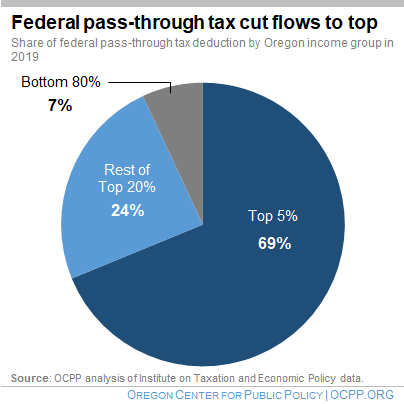 Stopping Oregon from replicating the federal pass-through business tax deduction was the Center’s top priority during the 2018 legislative session. Working with a determined group of allies, we fought to protect our schools and essential services. Bigger battles lie ahead in our shared effort to make Oregon a leader in assuring prosperity and opportunity for all its people. Today, we take a moment to celebrate an important victory.